As part of our series on project leadership training, we are exploring traits of effective leaders. 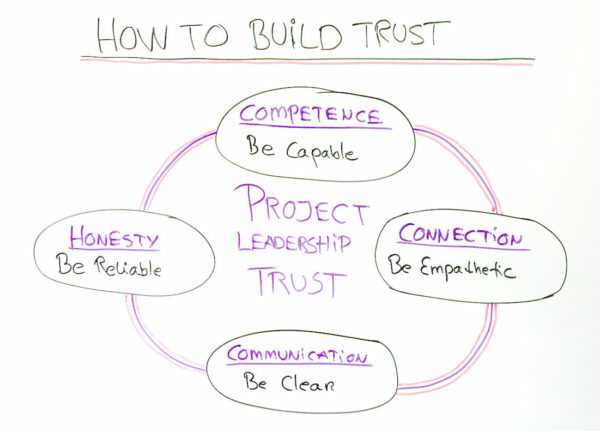 In today’s whiteboard session, Susanne Madsen, Leadership Coach, discusses the essential elements of building trust on your project. Competence: you need to be capable in your position. Connection: it’s important that you are empathetic to others’ wants and needs. Communication: if you can’t clearly articulate what you want then no one knows. Honesty: reliability and truthfulness go a long way in establishing a trustworthy relationship. Naturally, these are processes that take practice and time to show results. However, there’s no better time than right now to start. Once you’ve developed a sense of trust with your resources then you’ll be surprised at how better they’ll perform for you and the project. Pro-Tip: Trust isn’t only something that goes in one direction, say from the project manager to their team, but can also travel up the chain of command to your stakeholders and even vendors and regulatory agents. It’s important to push back on unrealistic timelines, for example, with a senior leader, so that your integrity is not undermined by not being able to deliver on time. For more leadership tips, watch Jennifer Bridges video post on traits of effective project leaders. Hi, I’m Susanne Madsen. Welcome to this white board session on “How To Build Trust”. We’re going to look at four elements today and these are four elements that you need to build trust either with your stakeholders or with your team members. The first one is competence. You must absolutely demonstrate that you are capable of doing a good job. It sounds obvious but we sometimes overlook it. What does it mean for you? It means that you must demonstrate that you master project management. That you’re good at planning, that you’re good at doing risks and issues, that you’re good at doing progress reporting etc. But there is another aspect. You must also demonstrate that you absolutely understand the bigger context of the project, the subject matter expertise. So that’s all part of being competent and doing a good job, but it takes more to build trust. We also have to build a connection. People have to feel that you can empathize with them. That means that you’re able to walk in someone else’s shoes. You can demonstrate that by spending time with people, asking questions, listening to them, and understanding what’s going on for them. Then that person will feel that you understand them and that’s going to help strengthen trust. The third element is honesty. You must demonstrate that you are reliable. Now most probably managers I know don’t walk around being dishonest, but what does happen is that they made over promise. They may say, “Yes I’ll get the minutes out by this time tomorrow or yes we will try to deliver this by middle of June.” But if you over promise, what happens is that you may not deliver on your promises and that comes across as dishonesty and that will severely impact your trust. The fourth element is communication. You must demonstrate to your stakeholders that you are able to communicate clearly about project progress. You must be clear so clearly communicate risks and issues. Be upfront about the true progress and the true state of your project and also be clear about how they can contribute and help get a project back on track for instance. All of these aspects help to form that circle of trust. So I invite you to reflect on this. Which aspects are you stronger in and which aspects do you need to strengthen? Thank you for watching. Please visit us again at ProjectManager.com.